"Because Shakespeares plays are so open-ended and adaptable, every production of a play has countless artistic decisions to make. ... Luhrmanns Mercutio heightens the ambiguity of the character. By casting the movies only African-American for the role, Luhrmanns production emphasizes Mercutios outsider status. Furthermore, Luhrmann stresses the homoeroticism lightly suggested within the texts Queen Mab speech and Mercutios jealous concern for Romeos love-life, as the already feminine Mercutio dresses in drag for the costume ball." 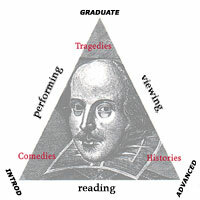 Joel Short: "In Love with Shakespeare"
viewing journals on BBC and graduate student performances of The Winter's Tale. Heather McIntosh: "Waking Up from A Midsummer Night's Dream"
Brandon Beach: "The Northern Lights"
Michelle Berchthold: "From Playwright to Production: the Process of Recreating Shakespeare"
Each student reports on a scene from one film version of the play. The report contains film clips which are analyzed with techniques modelled by the instructor's early lectures and by the assigned film critiques.